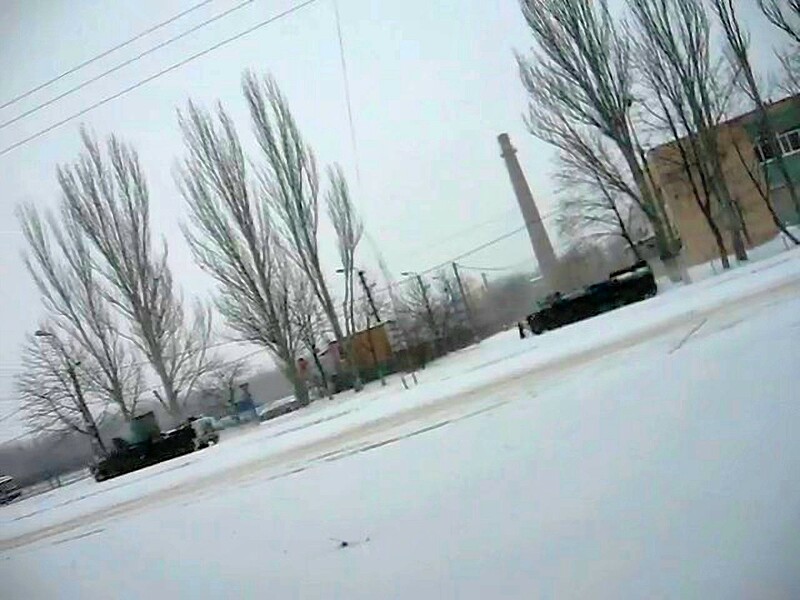 Early on Tuesday morning (February 14), an explosion rocked the Donetsk State Factory of Chemical Products, located in western Donetsk’s Kuybyshev district. 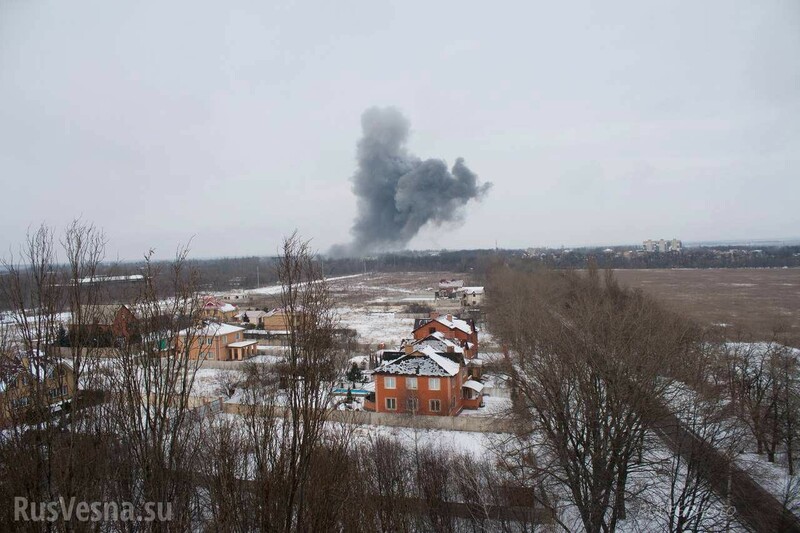 Separatist officials claim that the explosion came from a Ukrainian shelling, but Ukrainian officials counter that an accident at the factory caused the explosion. Without an examination of the site or photographs/videos of a crater or shelling, these claims cannot be verified or refuted. 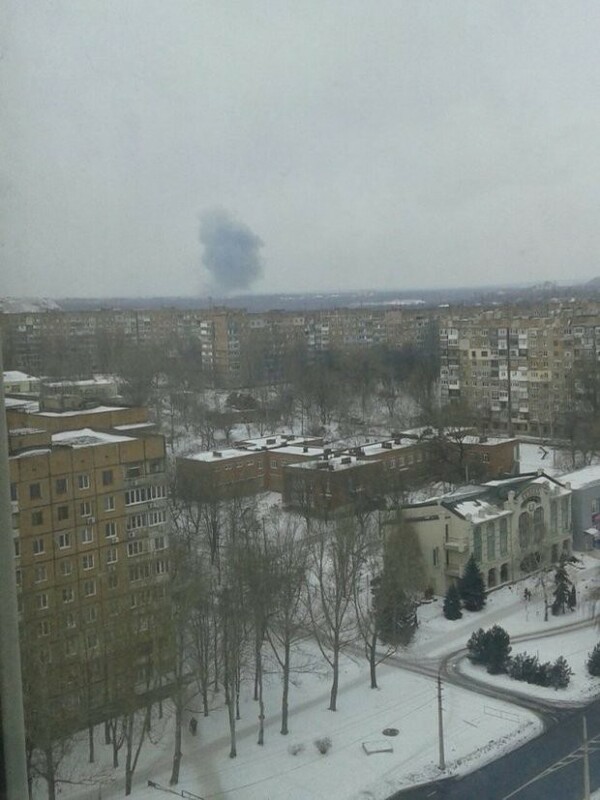 This photograph was taken from an apartment building in northwest Donetsk, facing west. 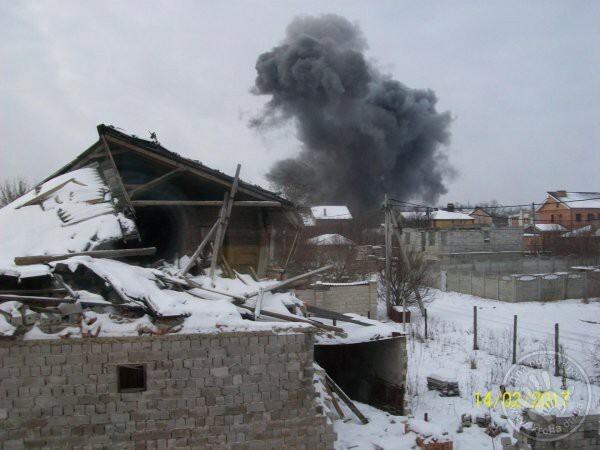 Additional photographs from locals and the Russian nationalist site RusVesna (Russian Spring) show other angles of the smoke rising from the factory. Much of the factory has been destroyed by the fighting over the past three years, but a few workshops are still active. 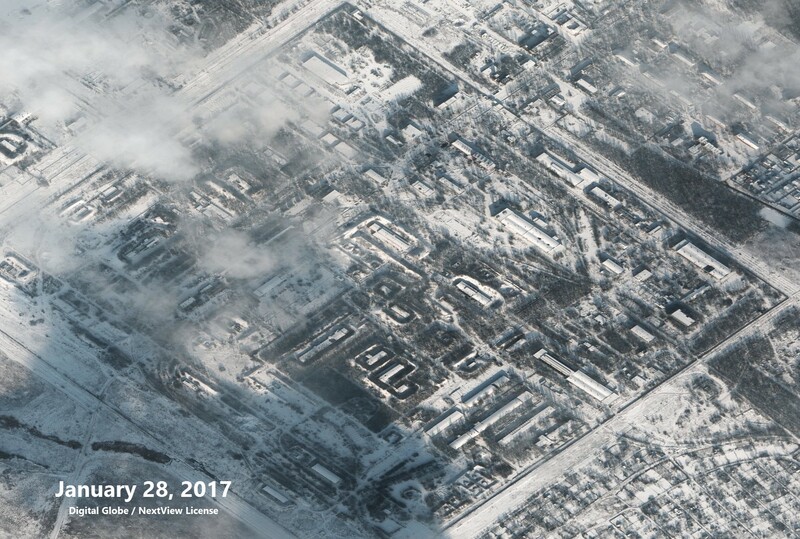 The full area of the Donetsk State Factory of Chemical Products on January 28, 2017. Digital Globe / NextView License. An incorrectly dated video has been spread of the explosion, supposedly showing the smoke from the February 14, 2017 event. In fact, this video was shot from the same perspective as a photograph of this week’s explosion, but shows what was likely a 2014 explosion from the same factory. Clearly, we can see that these videos were shot at different times due to the weather — there is snow on the ground from the photographs from this week, but it seems to be summer or autumn in the video. 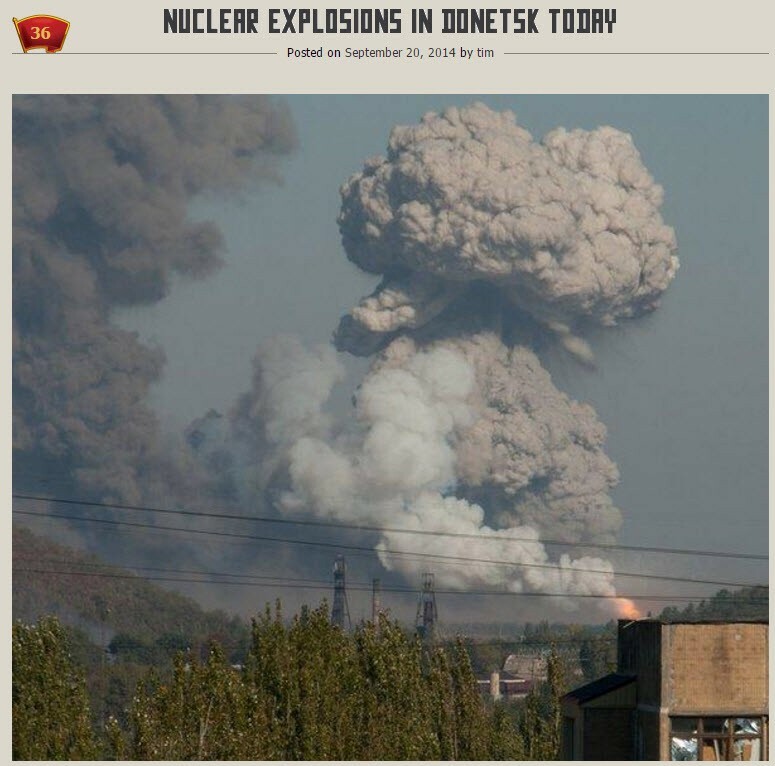 A September 2014 explosion at the Donetsk State Factory of Chemical Products produced a number of fake news stories, including some alleging (and then many resharing) that this explosion was the result of a nuclear weapon. In June 2015, the press center of the so-called Anti-Terrorist Operation warned of the potential catastrophe from the Donetsk State Factory of Chemical Products. About a week before this statement, on June 16, 2015, another explosion occurred at the factory — another in a long series of incidents, including explosions on August 19, 2014, September 20, 2014, October 20, 2014, and February 8, 2015. Many of the frequent explosions at this factory came from handling caches of munitions — lending additional credibility to the Ukrainian claim that this week’s explosion came from within the factory, and not shelling. DFRLab spoke with Wim Zwijnenburg, Project Leader of Humanitarian Disarmament at the Dutch organization PAX, regarding the humanitarian and environmental consequences of the frequent explosion at the Donetsk State Factory of Chemical Products. PAX works towards improved humanitarian response towards conflict-related environmental damage through research and advocacy in relevant international forums. DFRLab: Do the photographs of the smoke from the chemical factory tell you anything about any possible environmental effects or health hazards to civilians? Zwijnenburg: Depending on the source of the smoke, there will be likely acute health risk for those inhaling it. Pollution of groundwater and soil could result in long-term environmental damage and subsequent health risks, depending on quantity and types of chemicals present. But as we don’t know what was burning, it’s hard to tell. If it was munitions, here is a good overview based on open air burning of munitions/explosives in the US and associated health risks, and an useful review of scientific papers on the impact of ammunition and military explosives on human health and the environment. DFRLab: What overall trends have you observed regarding the environmental risks to civilians from fighting the Donbas? Zwijnenburg: A recent assessment by the World Bank demonstrated the scale and impact environmental damage can have, noting the “immediate concerns and future risks to public health, ecosystems, and people’s livelihoods” in the Donbass region. Damages to industrial facilities could result in the release of various hazardous substances into the environment, and form acute and chronic health risks to civilians if they are exposed to them. These substances could either be a direct source of exposure through inhalation or ingestion, or enter the groundwater and contaminate soil, thus posing long-term health risks, depending on the type of substance, dose and duration of intake. As there were already past-pollution issues in the region, concerns are that the fighting would exacerbate environmental health risks to civilians. Hence the need for improved identification of damages sites and critical infrastructure, and put in place monitoring mechanism for soil, air and groundwater pollution and awareness raising among local communities. But most important, fast remediation of contaminated sites are needed to prevent further exposure of civilians to these toxic remnants of war. Over the past year, the United Nations and other international organizations have turned their attention to environmental damage during the war in the Donbas. For example, on May 27, 2016, the United Nations Environmental Assembly adopted a resolution proposed by Ukraine regarding the “protection of the environment in areas affected by armed conflict” and was unanimously adopted. This resolution was largely inspired by the situation in the Donbas, but was also supported by Kuwait, Lebanon, Iraq, and other countries dealing with similar circumstances. Though Ukraine proposed this motion in the UN, environmental organizations have urged Ukraine to adopt the Environmental Impact Assessment law that was vetoed by President Poroshenko. For more information on the environmental impact of the war in the Donbas, read this report published in 2016 in “UA: Ukraine Analytica” and read this useful overview published by the ZoI Network in 2015 on the environmental hazards of the conflict in Donbas. On Tuesday, a convoy of military equipment was filmed on what was described as the street 30 let Pobedy (30 Years of Victory), in southeast Luhansk. The clip shows multiple MT-LBs — multi-purpose, amphibious armored vehicles that have been a common sight in the Donbas since 2014, including from documented examples of them coming from the Russian Armed Forces. Structure on the street 30 let pobedy in Luhansk, from a screen capture from a video on YouTube and a photograph on Panoramio. 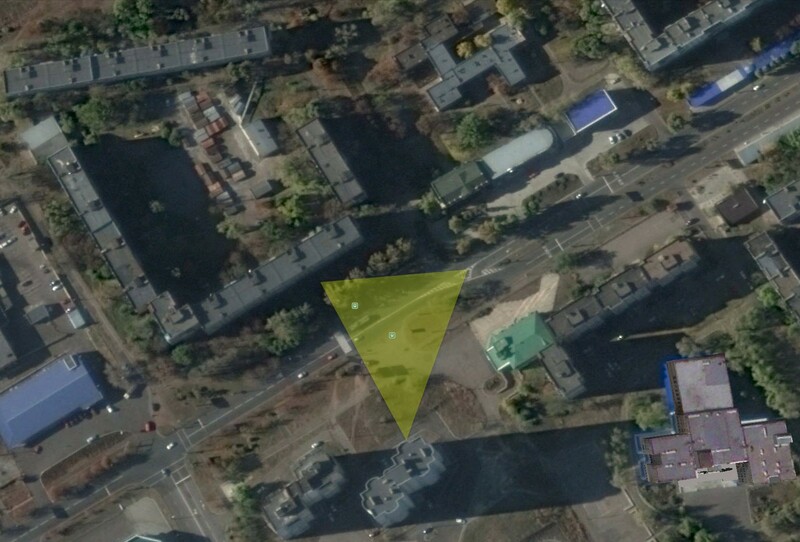 Located at 48.5554064, 39.3827273. The vehicles were headed northwest, through Luhansk, in the video. It is unclear where these vehicles came from, or where they were headed. For more in-depth analysis from our regional experts follow the AtlanticCouncil’s Dinu Patriciu Eurasia Center. Or subscribe to UkraineAlert.